Get 3herosoft PDF to EPUB Converter for free, today only. 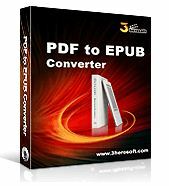 3herosoft PDF to EPUB Converter is an easy-to-use, fast and efficient PDF to EPUB conversion tool which is specifically designed to convert PDF to EPUB, making it possible to view PDF files on eBooks supporting EPUB format. Any third-party libraries or Adobe Acrobat are not required when converting PDF to EPUB and all original PDF features will be preserved after conversion.